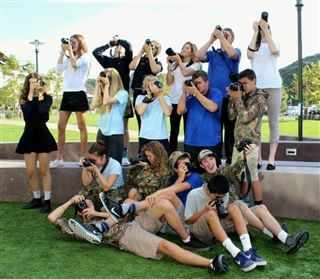 On Wednesday morning at zero eight hundred hours, students in AP/Advanced Photography were put through their paces during an on-campus boot camp. However, unlike at Camp Pendleton, these Pacific Ridge recruits spent more time contemplating angle and composition than doing push-ups and pull-ups. Mrs. Behr played the role of a kinder-than-your-average drill instructor, while the group ran through a review of camera controls and shooting modes, and tested out creative approaches to portraits, action shots, and landscapes. A few members of the class even donned camouflage for the occasion!